This October we have had a number of guides down in the desert Southwest, staying at my house near Las Vegas, NV. Some are here for guiding in Red Rock Canyon, Joshua Tree, and the Sierra. Others are here for continuing education through the American Mountain Guides Association. And still more are here to simply enjoy the best weather and some of the best climbing in the country. Autumn is in the air here in the desert, and although we don't have deciduous trees that change colors or cider mills to enjoy the fall harvest, we still have a festive spirit! We decided to get some pumpkins and do our best at climbing related carvings - here is the result from what we like to call "AAI South." To start, we have Mike Pond's Black Diamond themed winking pumpkin. Both of his eyes were supposed to be the BD logo, but an operator error was exploited to create this sly devil. Next is Jeremy Devine's American Alpine Institute inspired pumpkin. He did his best to copy our logo and carve it out, but without the special carving tools he did not have the ability to cut out letters. It was a valiant effort for sure. 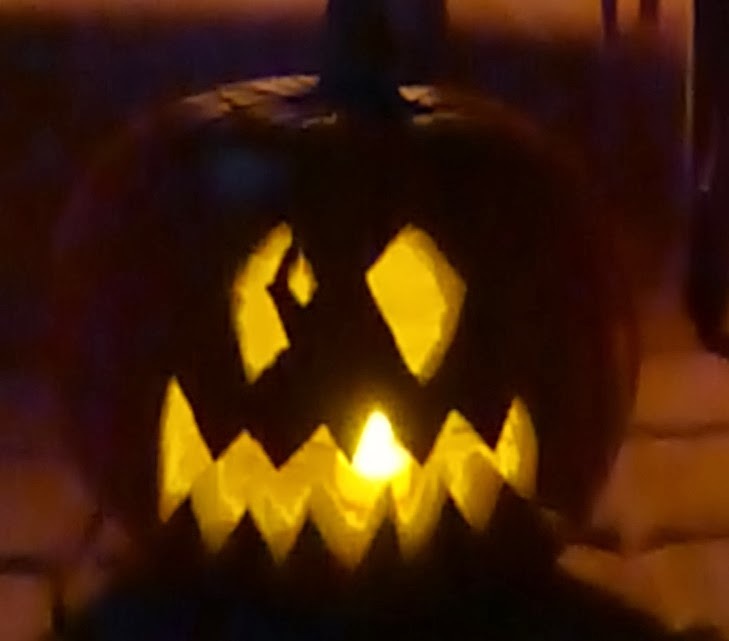 I went for more of a barbaric inspiration, with the execution of my pumpkin via a Petzl Sum'tec ice axe. I think this carving really captures both the aggressiveness and versatility of this fantastic piece of equipment. Well, this was our best attempts. I would love to see if anyone else has made climbing related pumpkin carvings! Shoot an email to andrew@alpineinstitute.com and I'll post them up here if I get any submissions. Last month I had the pleasure of guiding one of the most classic routes, and probably the most iconic, in Red Rock Canyon. Epinephrine is over 1500' in length, with 12+ pitches of quality rock climbing. The route is most well known for its chimneys, which vary in size and are quite physical. It gets a difficulty rating of 5.9, however I know 5.10+ climbers who have struggled to find out how to get through the 500 foot section of smooth walled slickness. We started that day at 04:15 on the Las Vegas Strip, began climbing at 06:30 topped out on the summit of Black Velvet peak at around 17:00, and were back in town around 21:00. It is a huge day, and a worth objective. My first role as a guide is to keep my guest safe, which makes it difficult to take pictures and film with an iPhone while belaying at the same time. Regardless, here is my best attempt at making a video of this awesome climb. Epinephrine 9.23.13 with Danny Bobrow from Andrew Yasso on Vimeo. It's been really foggy here in Bellingham this last week, but if you've gotten a chance to get up in the mountains, then you were probably able to get up above the clouds. If you are still stuck in the gloom this morning, then grab a cup of something hot and enjoy this nice, long freestyle skiing video to get you going this weekend. Kjerrskredkvelven (say that 3 times fast!) is a 900m high, big-wall-seized ice fall in Gudvangen, Norway. With difficulties of WI V/6 it can be considered one of the longest and most demanding ice falls in the world. The film shows the ascent of this monster line by Matthias Scherer and Tanja Schmitt back in February of 2013. Located in the remote reaches of Antarctica, Ulvetanna Peak is one of the most technically demanding peaks in the harshest environment in the world. Since it's discovery in 1994, Leo Houlding has dreamed of climbing this unforgettable peak. With the government shut-down behind us, we are able to get back and enjoy our National Parks. Many climbers have expressed the "hassle" this has caused with campgrounds closed and long-planned trips suddenly cancelled. But thanks to the National Parks Conservation Association, we also get a chance to see just how the Rangers and staff were affected by the closures. Nothing eats up time like building anchors. There are several pieces to the anchor building puzzle so it's not something you can learn all at once. There are many ways to practice but I've found that with so many popular climbs being bolted it's hard to gain experience building complicated traditional anchors. I have found that practicing systems at home has been very valuable for me. I like to use chairs, sometimes you need to add weight so they don't tip over but you can place them wherever you like and attach carabiners in different configurations and practice building different systems. In the following video you can see I have three carabiners on a step stool and then I have a fourth on another chair. The anchor that I demonstrate is a pre-equalized anchor in a series. Keep in mind the sole purpose of this is to demonstrate how you can practice at home. The video doesn't show angles properly so it may look like the fourth piece comes in at a 90 degree angle. This is not the case. Further, we'll assume that in the field I would lock all the carabiners and use the appropriate carabiners at the master point, etc. I've found the primary benefit of practicing systems at home like this is efficiency. Once you've placed your protection it should be pretty intuitive to rig up your system. If you been practicing lots of different options at home it can really speed things up when you take it to the field. I do not recommend practicing at home and skipping practicing in the field. You should still be practicing placements and building systems with a mentor who can give you feedback on things you may have overlooked. On Thursday, Teton Gravity Research came to town and brought their new film, "Way of Life" to the Mt. Baker Theater. In case you missed it, here is Sage Cattabriga-Alosa's segment. If you can't live without the full movie, you can download it on Itunes. Sage Cattabriga-Alosa in Teton Gravity Research's Way Of Life from Teton Gravity Research on Vimeo. Jake Sakson and Paul Kimbrough talk to us about what it's like to have a great ski partner who is on the same wavelength as you and that you can count on to not only encourage and push you, but also reel you back in when they feel something isn't right. And they also show us what it's like to rip some awesome tele turns! Holden Village is a Lutheran religious camp nestled in the heart of the Cascades. It is the gateway Cascade greats like Bonanza Peak, Mt. Fernow (two of the ten tallest peaks in Washington), and as Neil Provo shows us, it has some great backcountry skiing and boarding. And when I say "backcountry" this is about as far away from the crowds as you can get. You have to take a ferry across a lake, then you are bussed about 10 miles to the actual village. No lift lines here. First up this weekend, Todd Ligare melts your face with these rockin' lines in AK. He's charging hard, and fast, and big, and it's awesome to watch. Todd Ligare - Point 'Em from Todd Ligare on Vimeo. "STEPS" not only features great riding and skiing, but the folks involved in this project are also very conscious of the environmental impact of their sport. "The film pursues the question of whether or not snowboarding and skiing in today’s world can be done in harmony with nature." I know many folks are getting pumped for winter, but for a climber, October is an awesome time of the year as well. The cool, crisp temperatures are perfect bouldering weather, and this is a great time to be in the desert southwest. So here's some stoke for those of you who aren't quite ready to put away the crash pads. "As the yearly Bikini Ski Day party descends on a small mountain town, something lurks beneath the snow. When an unwitting rider causes an avalanche, it awakens a huge, menacing, pre-historic Snow Shark! Cut off from help by mountainous terrain and blinding snow, the local sheriff must make an unlikely alliance with a motley crew of snowboarders to take down the Snow Shark before the white hills run red with blood!" I love camping and climbing in the desert. There's something beautiful about the desert landscape. I lived in Las Vegas for nearly a decade and guided there. Now I spend about six weeks a year in the desert, camping, guiding and climbing. When I'm camping there, I love the beauty at night and I love the beauty in the morning. What I don't love is the wind. The desert wind can be incredibly viscous. Forty, fifty and even sixty mile an hour winds arrive in the desert with an alarming frequency. If you camp in the desert for more than seven days, you will definitely experience a wind storm. The wind seldom has an impact on climbing. You can usually find a crag that is sheltered. Camping, however, is another story. Red Rock Rendezvous after a major wind storm. by the wind and blown out across the desert. A tent in the barb wire after a wind storm. I have climbed and guided all over the place, including on many large mountaineering expeditions. But I have to say that the worst winds that I have encountered are in the desert. There are a few differences with the desert and a mountaineering trip. First, on a mountaineering trip you can often dig in and build wind breaks. And second, you generally have a mountaineering tent in the mountains, which tend to be tougher. And third, you don't have to deal with sand. If you plan to do a desert trip, you should plan to bring a mountaineering tent. These can deal with the wind more adequately and they don't have as many places for sand to get into the tent during a storm. If you intend to leave your camp for the day during a storm, it's not a bad idea to collapse your tent. Just take the poles out of the base and lay the whole thing down. Put a few rocks on top of it so it doesn't blow away. The last thing you need is to come back to camp to find that you have broken poles, or worse, that your tent is gone. It's good to tie your tent down to solid items, whether you intend to leave it up or collapse it. Sometimes wind storms arrive unexpectedly. 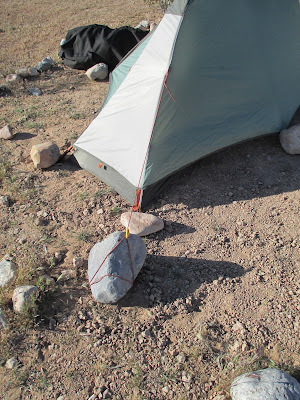 A tent with the guy lines tied to large rocks. ...and then place large rocks over the stakes. Every guy line should be attached to rocks. Even small rocks will keep your tent from drifting. I think that the most difficult part of my long desert trips is the wind. When I do a trip with no wind storms or only one or two, I always feel like I got away with something. The Outdoor Film Season is in full swing, with lots of shows nation wide. Last night, here in Bellingham, we had Powderwhore's "Elevation" featuring backcountry bliss from Oregon, Utah, Wyoming, Alaska and right here in the heart of our Cascades. Another interesting one to check out is "Rise" from Eye of the Storm Productions and Arc'teryx. Rise Official Teaser from Laurent Jamet on Vimeo. I've probably already put this clip in earlier this year, but Sherpa Cinema's "Into the Mind" looks so freakin' beautiful that I have to put it in here again. If you happen to be local, WWU will be showing this on Oct. 10 at the PAC Concert Hall. Be there or be square! Into The Mind - Official Trailer 2 from Sherpas Cinema on Vimeo. In 2010, Dallas Kloke, a mountaineer with fifty-years of climbing under his belt, was killed tragically in a climbing accident. Kloke was a renowned first ascentionist and the author of several guidebooks. His home crag was the iconic Mount Erie, situated above the city of Anacortes, Washington. I met Dallas several times over the years, but I didn't really get to know him until near the end of his life. I served on the Mount Erie Climbing Committee with him for about a year-and-a-half before he passed away. In that time I knew that I had found a kindred spirit in a man who loved exploring the mountains. Tragically, I never had the opportunity to climb with him. Dallas was responsible for dozens -- if not hundreds -- of routes at Mt. Erie and he wrote one of the most popular guides to the crag, Rockin' on the Rock. And though Dallas was an amazing man -- a middle school teacher, a track coach, and a climber -- his guidebooks always felt like they needed a little bit more work before they went to print. They were often a bit confusing. For example, in his winter mountaineering book he placed the routes in alphabetical order instead of in a geographical order. It was for this reason, that I was happy to hear that his Mount Erie book would see a second, postmortem edition. After Dallas' death, two local climbers -- Jim Thompson and Aaron Bryant -- got permission from Dallas' family to develop a new edition of his Mount Erie guide. The pair tirelessly worked to update the text and to make sure that it all made sense. The result is a beautiful book. 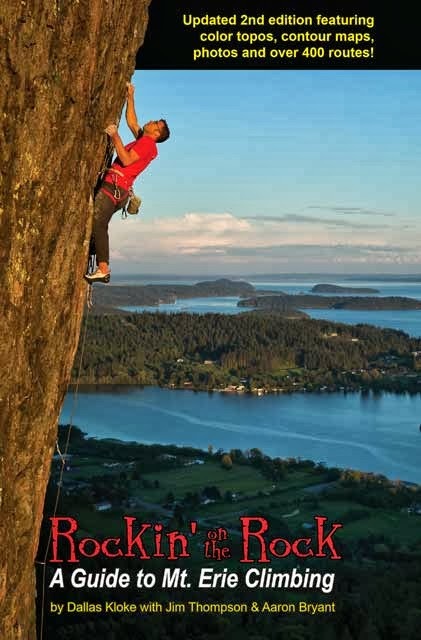 A full color text stuffed with approach beta and chocked full of Mount Erie's finest climbs. The text is like having a local companion who knows every nook and every cranny of every crag....which was what it was like walking around the mountain with Dallas. I think he would be really proud of how this book turned out. There are many ways that people have paid tribute to climbers that have passed on. Some get plaques, others get peaks, features or routes named after them, and yet others find their ashes left on a mountain. However, in some ways this was the best tribute that these two individuals could have made to both Dallas and to the Mt. Erie climbing community. Dallas was a climber and a guidebook author and Mt. Erie was his home. If there is one iconic climber, one person who stands out above the rest as discovering more new routes, climbing more rock, and ascending more ice than anyone else in history, it's Fred Beckey. Alpinist Colin Haley and Patagonia teamed up to make a video about the 90-year-old climber, about him climbing in a place that he'd never been before: the Dolomites.